What is the Fuel System Cleaning All About? No matter what make or model vehicle you drive, it needs efficient fuel delivery to provide peak performance and maximum gas mileage. Virtually all modern cars that have internal combustion engines use fuel-injected systems to deliver gasoline to the combustion chamber. All cars also use traditional gas tanks, fuel lines, fuel pumps, fuel filters and other parts that ensure smooth and efficient fuel delivery during operation. Those components need regular maintenance to ensure your car continues working as well as possible and you can get the maximum potential gas mileage during your travels. Over time, the fuel filter captures and collects dirt and other debris that manages to get into your fuel system. Such contaminants can get into your fuel system in many ways, but the most common are condensation, rust and dirt and other debris entering the system while refueling. Such contaminants can hinder engine performance and lead to problems further down the road. A good system cleaning will replace the fuel filter as needed and ensure no dirt, debris or other contaminants are affecting your car’s performance. Ignoring fuel system service can have drastic results if you skip it long enough. In worst-case scenarios, dirt and debris could enter your engine compartment and cause serious damage to critical parts, such as valves. When those parts fail, your car stops running, and you likely will need a tow and costly engine repairs. More commonly, you will see decreased engine performance and gas mileage until either you remedy the situation with a fuel system cleaning service, or car parts start failing, and your car starts stops running. 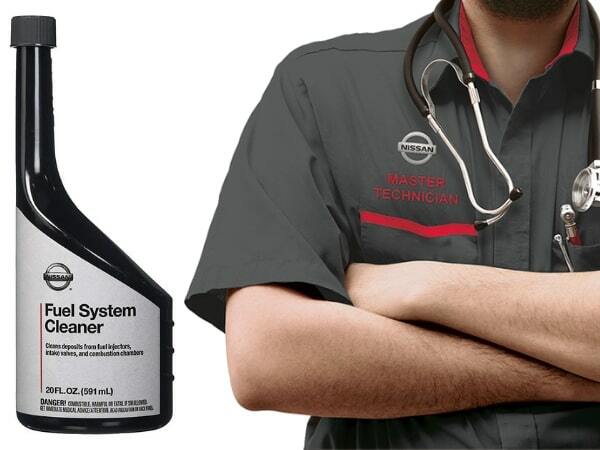 Nissan of Tustin, CA, offers complete fuel system cleaning service and maintenance to keep your car running as well as possible. Experienced, certified technicians can diagnose your system quickly and perform any necessary maintenance on virtually any make or model of car, truck, SUV or van. Work gets done quickly, efficiently and with accurate estimates provided when more than basic maintenance is in order. Whether you are in Tustin, CA, or one of the nearby communities of Irvine, CA & Santa Ana, CA, your engine will operate better with a fuel system cleaning service.